Develop competitive advantage with our above template which contains a diagram of red and white spheres forming an arrow. You have the process in your head, our template design showing teamwork and individuality will illuminate your thoughts. 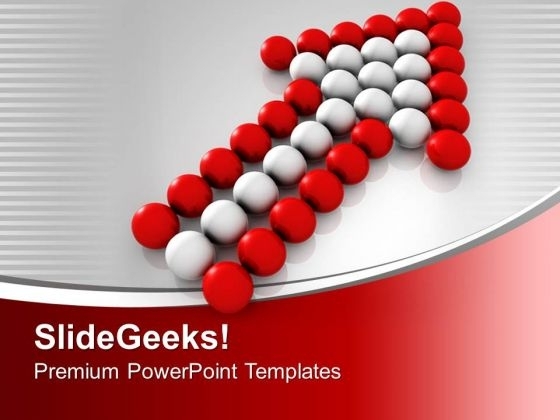 Adjust the above image in your PPT presentations to visually support your content in your Business PPT slideshows leadership, strategy, success and business competition PPT presentations. Deliver amazing presentations to mesmerize your audience. Start delivering strong and sustainable gains with our Arrows Team Marketing PowerPoint Templates And PowerPoint Themes 1012. They will make you look good. Allow your thoughts to flow with our Arrows Team Marketing PowerPoint Templates And PowerPoint Themes 1012. They will develop your creative aptitude.